Primary 4 pupils were set a STEM challenge today. Pupils had to construct a building at least 60cm tall. Furthermore, the construction had to be able to withstand the weight of a ball. The tower/building also had to be able to stay upright when a force was exerted on it. The pupils really enjoyed working in teams and fulfilling the different aspects of the challenge. Well done to everyone for being so creative and for being very resilient too when things sometimes did not go exactly to plan. Great job, P4! Primary Four used play dough to make pizzas and cakes, today (thanks to our Primary Two friends!). We cut the whole pizzas and cakes into equal parts and recorded how many parts were out of the total number, recording and naming it as a fraction. For example, two out of three equal parts equals two thirds. We were even able to compare the sizes of fractions, for example two quarters is the same as one half. Easy peasy! Primary 4 have been learning all about measuring in centimetres. They learned a lot about the significance of accuracy when measuring, as well as the importance of which tools to choose depending on what you need to measure e.g. ruler, measuring tape, metre stick, trundle wheel. Pupils took great care with measuring in centimetres and even millimetres. Primary 4 really enjoyed measuring curved objects too and used a measuring tape to measure each other! They had great fun! Primary 4, Mrs Gardner's class, really impressed everyone today with their marvellous joined handwriting homework. Mrs Gardner gave her class the option of writing in joined and these wonderful pupils couldn't wait to push themselves to go for it and go joined! Well done everyone for being brave and taking the plunge! #Proud teacher alert! Primary 4 had such an amazing time today; the pupils came to school dressed as 1940's children. First, out of nowhere, we heard a WWII siren sounding, warning of an impending Luftwaffe Blitz on Belfast. Everyone had to take cover in our imaginary Anderson Shelter. We were prepared though as we brought card games, marbles, books, comics and or course our torches so that we could see in the dark. After the danger had passed we played street games. We enjoyed skipping, we swung hula hoops, played leap frog and 'Queenio who's got the ball?'. Finally, we heard Winston Churchill announce that the war was over and that there was victory in Europe. All that was left to do was have a party to celebrate VE Day. We enjoyed biscuits, now that there would be less rationing, and drank juice. Finally, we enjoyed some swing band music and some dancing to end the day on a high note. Primary 4 enjoyed exploring 3D shape today. They examined each of the shapes and then carefully recorded the properties - faces, edges, vertices. Earlier this week pupils also identified the nets of these and other 3D shapes. We each look forward, now, to constructing our own 3D shape and completing a detailed writeup about it. Primary 4, Mrs Gardner's pupils, were so inspired by the P7 Anderson Shelters that they decided to go ahead and make some of their own. Mrs Gardner was surprised as she didn't expect this but she was VERY impressed by the creative masterpieces the children had made. Everyone in the class was very impressed and couldn't wait to have a closer look. Primary 4 had the tremendous privilege today to listen to and speak with people who experienced life during WWII. One of the visitors was a German lady; she told many interesting stories about life in Germany, at this time, and about the British Red Cross arriving when the war ended. The stories told by the visitors captivated everyone present and gave us a real sense of what WWII was like. We had a talk from a soldier who landed on the Normandy beaches, where there were heavy casualties, as well as from a lady who saw the Luftwaffe airforce arrive and fly over Belfast Lough while Belfast went up in flames. Words cannot express how precious this encounter was today for all of those present. We will remember the words we heard for a long time to come. Thank you to Mrs Brown, Mrs Tyler and all of the people who gave their time to passing on wisdom and knowledge to our younger generation, reminding us to avoid war at all costs. Have a look at the lovely joined writing Mrs Gardner’s class have been doing. The standard of work is very high. Well done children. Keep up the good work! Mrs Robinson’s class dramatised life as evacuee children during WW2 and today they worked with writing partners to complete their diary entries. How special do these look?! Primary four enjoyed reading the story of the Wind and the Sun and acting out the story. We also had a class orchestra who played both piano and forte with the percussion instruments. It was a Fab way to spend Friday! Primary 4 enjoyed using a wide range of resources today to learn more about division. A great time was had by everyone. 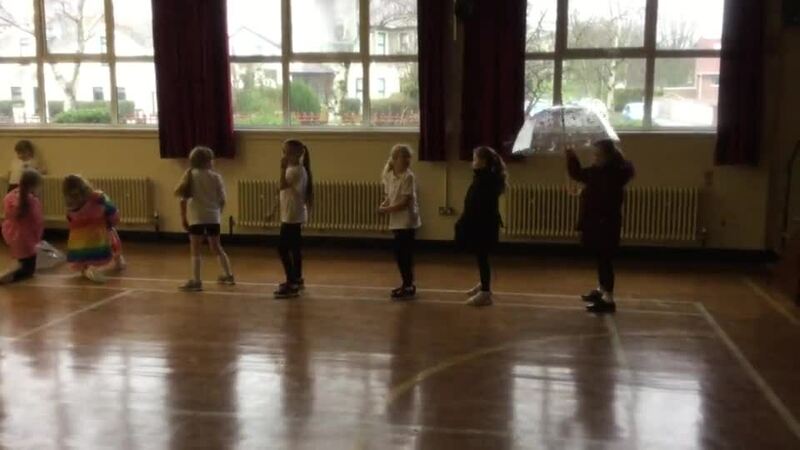 P4 Mrs Gardner's class were ‘Singing in the Rain’ today in PE. Mrs Gardner had a really tough time choosing the winning group. Have a look at the video below to decide who you would have picked from the final three contestants! P4 Mrs Robinson's class were ‘Singing in the Rain’ as part of their weather topic. The children had great fun creating their dances together and performing them for each other at the end of the topic. Two Primary 4 boys in Mrs Gardner's class led the Numeracy lesson today and they were tough taskmasters! The boys asked pupils to tell the time in both analogue and digital time and they made sure the rest of the class followed the correct steps. They asked the pupils to give answers in minutes past and minutes to the hour. They smashed the lesson - well done boys!! This week’s ripple of kindness focus is “teamwork” and Primary 4 had great fun with this challenge! Working as a team, each group had to balance and lower the hoop to the ground using only a straight index finger. Some teams came up with their own ideas to make the challenge more difficult such balancing on one leg! Super teamwork everyone! Miss Gillespie from Carrickfergus Grammar School visited Mrs Gardner's class this week. She was a total hit with the pupils. Miss Gillespie was eager to teach a lesson and so today she led from the front. She asked many interesting and stimulating questions about what beauty is, what kindness looks like and she taught pupils that we should all value ourselves just the way we are. It was a great lesson for us all! She is welcome back to P4 anytime and the pupils gave her lesson a massive thumbs up. During ABL pupils enjoyed making 'Wind and the Sun' masks and painting winter trees. Groups of pupils presented a well planned, previously written in pairs, weather forecast for their islands (which were created by following precise instructions). Pupils spoke very well and enjoyed the excitement of a pretend live broadcast. Watch out Cecilia Daly! Today Mrs Gardner's class learned the language associated with division - share, split, group, divide. They learned to make connections between their division and multiplication facts. Pupils then learned how to share equally between 2-6 pupils. They did a great job! Two primary 4 boys were so competent in their knowledge of 2D shape that they became the teachers. They assessed the work of the rest of the P4 pupils. They discussed which comments they should add, depending of how many answers pupils got right or wrong, and they marked the work very carefully - as you can see! Well done boys, there's plenty more where that came from!!! Primary 4, Mrs Robinson's class, enjoyed learning about division today. They now know how to divide by 2. Primary 4 School Council members, in Mrs Gardner's class, fed back the minutes from last week's School Council meeting to the rest of the class. They enjoyed raising a few exciting issues and heard ideas/feedback from the rest of our class. We all think that they are doing a great job! Keep up the great work! P4 have been learning to read the weather, record temperatures in degrees Celsius and have been keeping a watchful eye on whether the meteorologists have been getting things right! They have been enjoying searching the Internet to check weather forecasts and have been enjoying recording our daily weather as well. Primary 4 have been learning about quadrilaterals and were asked to investigate how many different quadrilaterals they could make using geo-strips and geo-boards. They really enjoyed this investigation work. Primary 4 have been putting together well choreographed dance moves, for the second week in a row, to the famous song 'Singing in the Rain'. Their topic is 'Whatever the Weather' and I cannot wait to see the big dance finale. Keep an eye out here for the final (dress-up) event! Primary 4’s topic is ‘Whatever the Weather’. During ABL time we made wind catchers, researched and recorded interesting facts about weather, painted wintry forest scenes and made weather maps for presentation to the class next week. Barra Best, you’d better watch out! Mrs Gardner's primary four pupils have been very creative this week. They made fabulous Christmas reindeers. For the last few weeks we have been singing 'Rudolph the Red Nose Reindeer' (fun version) a lot so we decided to make reindeers to mark the occasion! Have a look at the finished products below! A big thank you to Romi, this month's pupil of the month, for all the extra help she gave her teacher in class! Mrs Robinson's primary four pupils have been very creative. 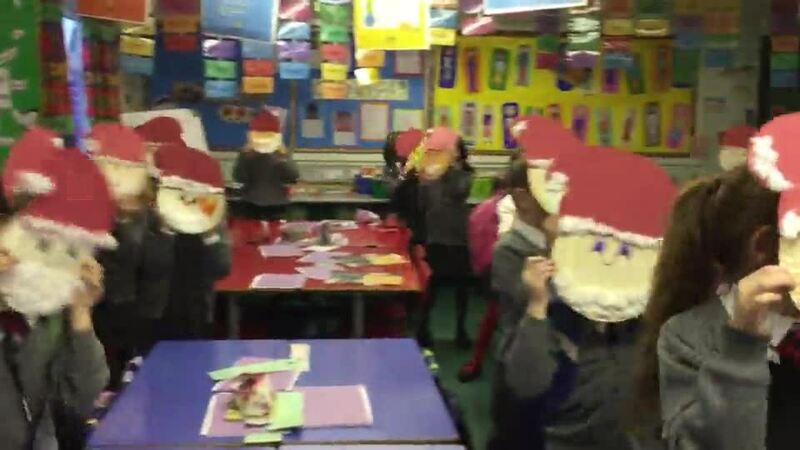 They made fabulous Santa faces! Have a look at the finished products in the video clip below! Ho ho ho! Primary 4 had a brilliant time yesterday taking part in the Hour of Code. They were able to choose which activity they wanted to do - 'Star Wars', 'Minecraft' - some pupils even explored the more festive option of 'The Grinch'. Everyone had a great time and some pupils really pushed themselves to get through the levels and complete increasingly difficult challenges. Pupils also supported each other and got their heads together for some paired learning when aspects of the task got a bit tricky - what a great approach to problem solving! They now have personal logins and I hope they will enjoy using specific activities at home as well as in school. Primary 4 have been enjoying their topic ‘School’s Cool’. They received four mystery bags from four different members of staff, each staff member having a different job in our school. Pupils had to become detectives; they had to work out, from the clues provided, who owned each bag. Most of the groups guessed correctly but one group just couldn’t work out who owned their mystery bag. Well done P4, Inspector Clouseau watch out! Now it is time to complete our write-ups and make clay faces of our mystery characters for Art. Primary 4 have been enjoying using Cuisenaire to apply their understanding of multiplication. This week they have been learning about Commutative Law and they have had a few challenges thrown their way. As you can see, from the great answers, P4 are doing their teacher proud! Well done kids! All of Primary 4 were very lucky to have Emma from Young Enterprise come in and teach them today. They explored the concept of ‘Community’ and thought about what type of business they could bring to the town they were presented with on the board. Children then had a vote about whose business idea was best. Overall the children learned a lot, they were completely engaged in their learning and the activities given to them, and they had great fun mixing with their friends in both P4 classes. Mrs Robinson’s class enjoyed a shared writing session this week! The pupils’ creative juices were overflowing!! After a shared session, they wrote their own pieces and then they helped edit each other’s work. It was so much fun...P4 can’t wait until the next lesson!! Primary 4 love maths challenges. They have been enjoying games and extension activities using Active Maths resources. Furthermore, pupils have enjoyed using their counting on strategy to work out change from 50p and 100p. P4 have been enjoying working with clay this week. They manipulated the clay and used a range of sculpting tools to make faces of four different members of staff - Mrs Miller, Mrs Beggs, Mr Kirk and Mrs Love. Pupils worked very hard and some pupils learned how to successfully attach a nose to their clay face. I can’t wait to see how good they look when they are painted. Mrs Robinson's class were busy today building a playground out of lego during ABL. Mrs Robinson’s class work as engineers to explore how the playground is constructed. Watch out for our playgrounds built from junk materials! Primary 4 enjoyed visiting Legg Park today. They looked at the shapes and discussed the recycled materials they would need to collect in order to build junk parks during ABL. They had a great time playing on the equipment before we left to come back to school. Primary 4 are so lucky to have Daniel from IFA to teach them excellent ball skills and brilliant football related games. Today pupils played Statues, Pac-Man and Bench Football. Pupils had an amazing time and they cannot wait until next week! Thank you, Daniel!